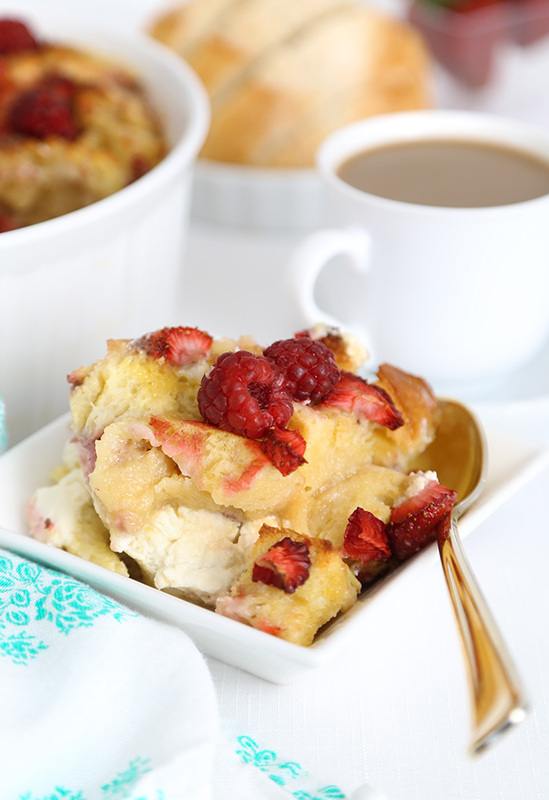 We are in the midst of strawberry season, and this breakfast bread pudding recipe is a great way to put those berries to good use! It's such a simple fix, and so flavorful. Below the toasty top layer of bread and berries you'll find pockets of cream cheese... seriously folks! 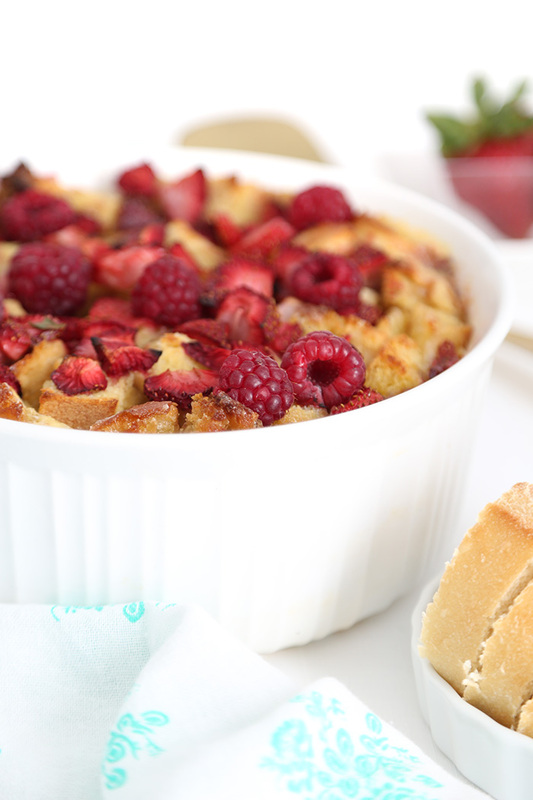 I'm not kidding when I say this is one of the best bread pudding recipes I've ever made. The acidity from the red berries gives balance to the creamy elements. My husband says it's like eating strawberry shortcake for breakfast. I'd have to agree! I love the flavor of mixed red berries so I added a small container of raspberries in with the strawberries. This red berry version could be altered to a blue/purple berry version when blueberries and blackberries are at peak. I can't wait to give that a try! 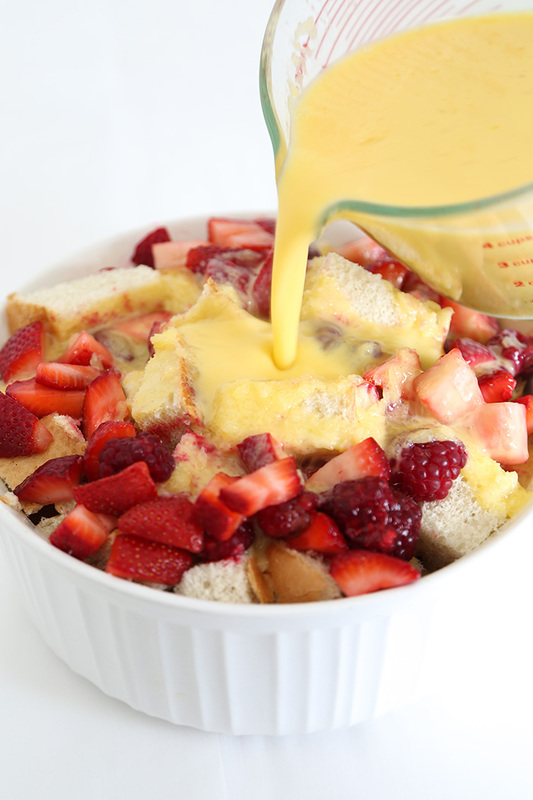 Layers of bread, cream cheese, and berries are soaked in rich egg custard. Most any loaf of bread will work with this recipe. Soft Italian or white bread is my preference because you don't need to wait for the bread to absorb the custard; it can go in the oven straight away. If you have a firmer bread (crusty baguette) allow the custard soak into the bread for about an hour before baking. See those cream cheese pockets? So good! It's even better with coffee. This would make a lovely breakfast for overnight guests. I'm inclined to serve warm maple syrup and whipped cream on the side, especially for company, but it's darn near perfect as-is. A 16 ounce carton of strawberries, once capped and sliced will give you the approximate 10 ounces needed for this recipe. Taste your berries! If they are very tart, you may increase the sugar in the recipe to 1 cup. Blueberries and blackberries can be swapped for strawberries and raspberries in equal amounts. Preheat oven to 350°F. Coat a 2 1/2-3 quart baking dish with cooking spray. Slice bread into 1-inch cubes. Cut cream cheese into small cubes. Place half of the bread cubes in the prepared dish. 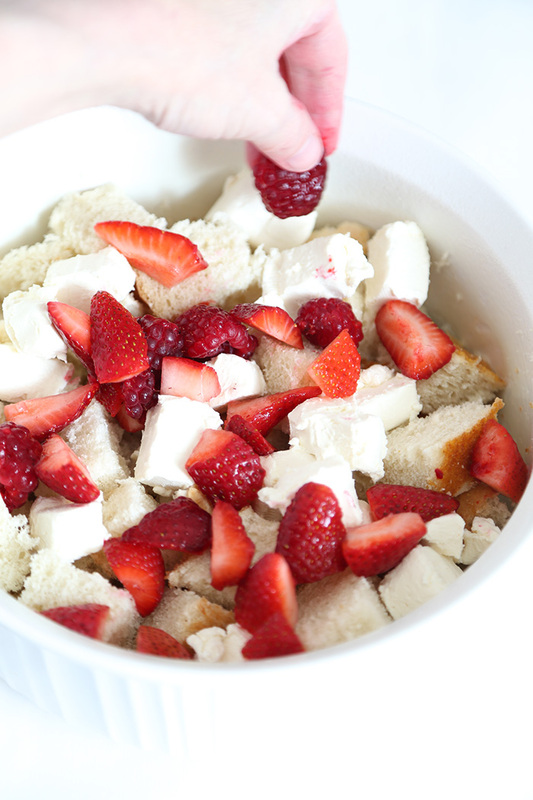 Top evenly with the cubes of cream cheese and half of the berries. Top with remaining bread cubes and berries. 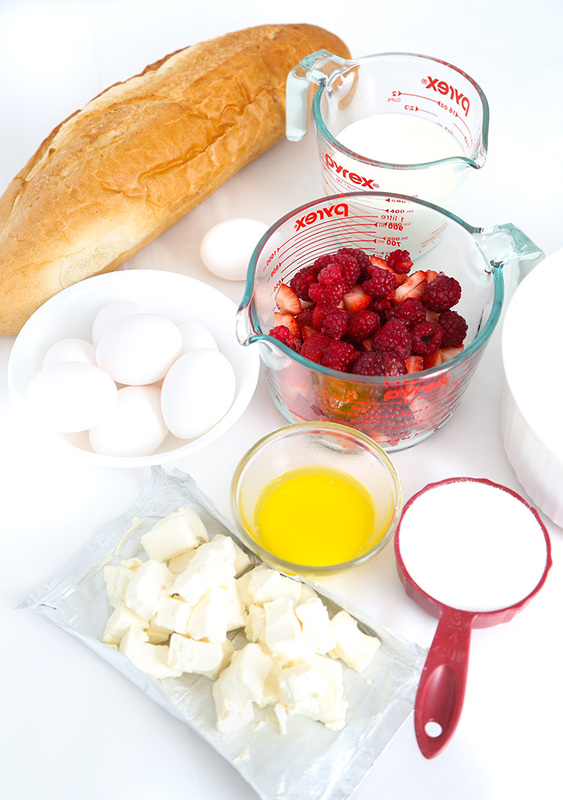 In a large mixing bowl, combine the eggs, milk, sugar, and vanilla. Using a whisk, mix them together well until thoroughly combined. 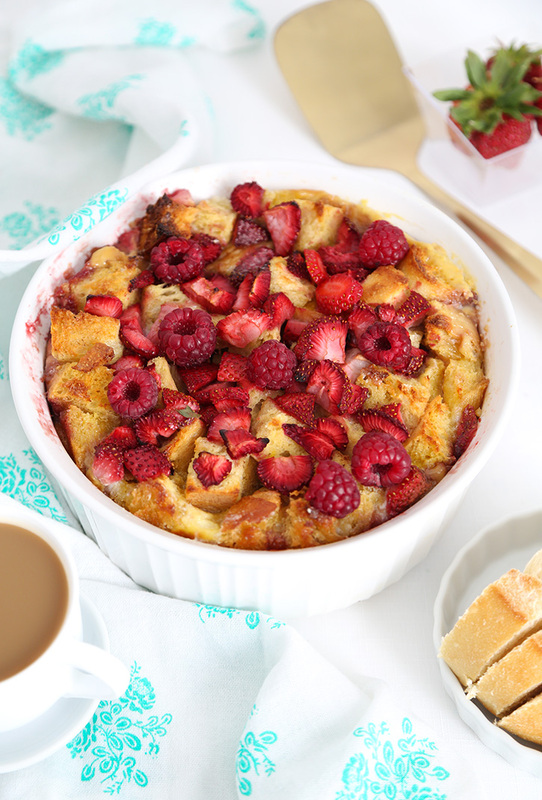 Whisk in the butter and immediately pour over the layered bread and berries in the dish. Serve warm. Accompany with maple syrup and whipped cream, if desired. 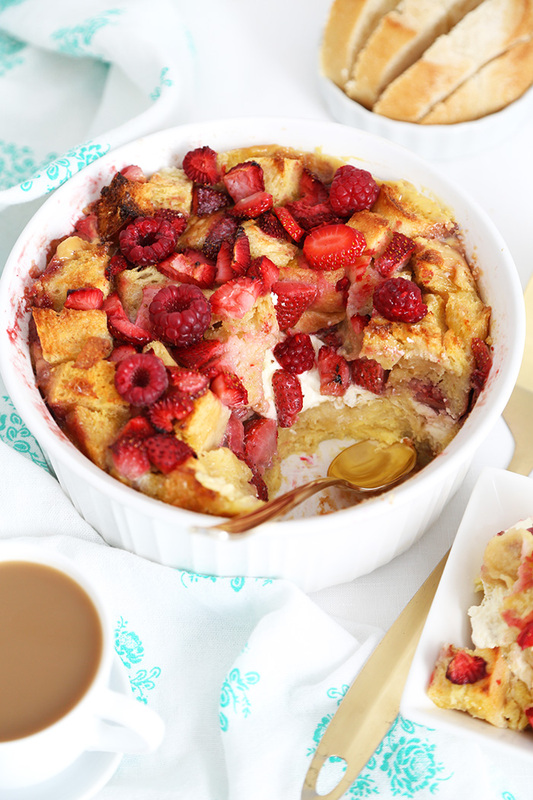 Looks absolutely delicious and perfect for weekend brunch! i love these. it looks delish!